I think it was the cable TV show What Not To Wear that first woke me up to this deceptive word. Whenever the person getting a fashion makeover tried describing why they wanted to hold on to one of their old, beat-up pieces of clothing, they almost always described it as comfortable. At this the show hosts would cringe and go on a rant about why comfortable is not on the list of criteria for looking good! In the same way, comfortable does not make the list of criteria for being successful. I get it. Life is hard, and it’s easy to become complacent. I’m that way too. I remember eight years ago I was not only complacent, I was stubborn about being complacent. I was seeing signs at work that my job may be eliminated, but I was choosing to ignore them. I remember telling my wife, “It took me two years to find this job, I don’t have the energy to look for another one right now!”. Yet despite my will power, and despite my stubbornness and complacency, my job was eliminated, just as I knew it would be. Because of this I was in the worst position of my life; No job and little preparation for another. 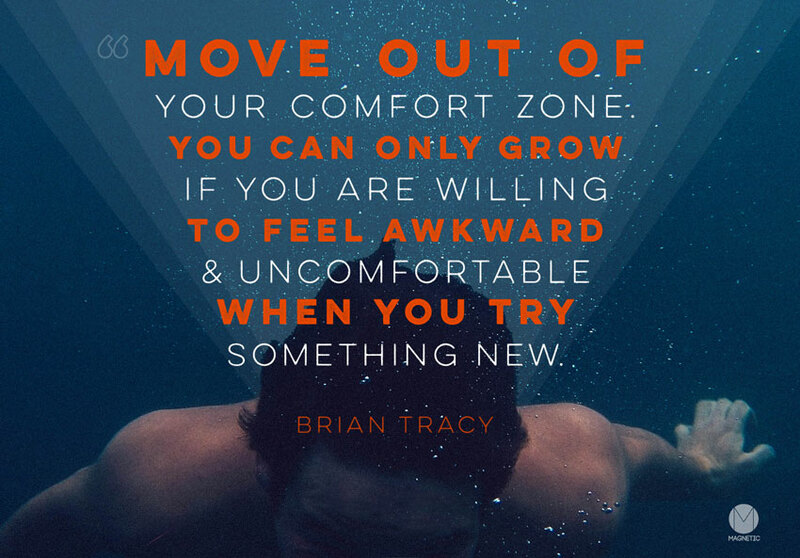 I’m not sure how much I could have done at that late date, but it would have involved pushing out of my comfort zone and forcing myself to grow. Something that would have been much better done on my own terms that it was sitting around and waiting for a round of layoffs, or and pretending the problem didn’t exist. I love that Brian phrases this quote so well. He uses real words like awkward and uncomfortable. Brian is right, it is awkward to put yourself out there. When you’re on a new path you’re out of familiar territory. You may venture off of the path and you may get bumped and bruised. But there is one thing that definitely will happen: you will move forward, and you will learn, and you will grow.